iPad supports manual file transfers through iTunes. However, at this moment, it doesn't work as smoothly as you would expect. There is a dedicated area at the bottom of the Applications pane (click on the iPad icon inside iTunes to access it) dedicated for this task. On the left side there is a list of all the apps that can support file transfers (not all of them can). Click on one app, and a list with all its documents will appear on the right side. Using these panes you can easily transfer those documents to your computer and viceversa: It's a simple drag and drop operation. At least, that's how the theory goes. The practice is not as simple, depending on the application. For example, I couldn't get image files to transfer between Autodesk Sketchbook and my computer. It would give me an error related to file naming conventions every time. I could transfer image files from my computer to Sketchbook, but then Sketchbook won't recognize them. This may be related to supported graphic formats, however. Other applications, like Apple's Pages, Numbers, or Keynote, have to go through an import/export process. I don't know if this is because the file formats are different, or if the reason is some kind of document processing needed to store the documents inside its internal database. 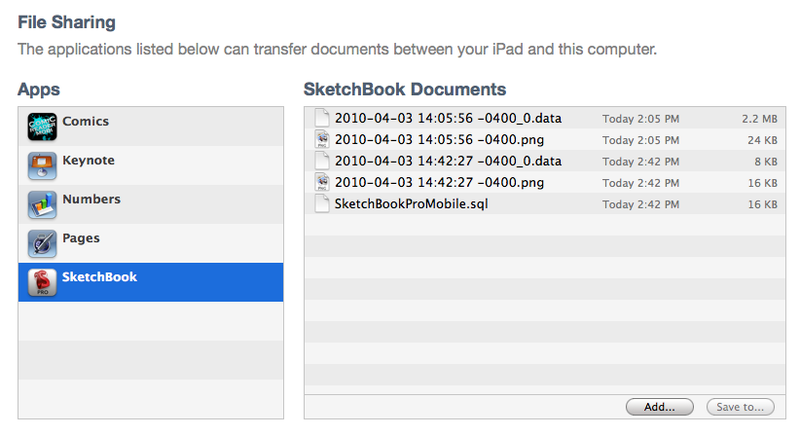 Once I transferred a Pages document into the iPad, it wouldn't appear directly into the documents selection menu. Instead, I had to use an import button inside that menu, which would "import" the document into the app internal storage database (by the way, it has to be a iWorks'09 document. iWork'08 documents aren't compatible). The same process applies to the iPad to computer transfer. From Pages there are three choices to share documents: Email, Upload to iWork.com or Export. The last option will process the document into a native Pages'09 document, which will appear into iTunes' file transfer area.